Author doesn't have a description, so I (MetroidMst) will provide one from my fond memories of this fine hack. Oxide is a small hack. It is weird. It has a single Missile expansion that gives you a real concussive load. Items progression is very odd. Area names are quite interesting, and exploring is a big focus. Short, small, and on the easy side. But still a very good hack. And of course, there is Barf Kraid. Oxide is one of the weirder and wackier hacks out there. It is pretty short, easy, and full of unknown amounts of genius. Barf Kraid and a single Missile Tank provide highlights to a pretty fun playthrough. It is definitely worth checking out. This is one of the few hacks I would rate as five stars. It's short, it's easy, and it's FUN. Nothing really compares to Oxide, with all its silliness and general goofiness, it's a must play in my opinion. Oxide looks like your average Super Metroid. But wait! Look at all of these missiles you just got! Wow, you're going to have a lot of fun trying to run out of those! No kidding! The only downside to this hack is a bit of backtracking, but I had too much fun spending missiles to care. Oxide is a really fun play, with very unusual item progression, boss placement, and music and resulting sound effects. Blasting everything with missiles was a lot of fun. Items were pretty easy to find without feeling like the game was throwing them at you. Some areas felt too linear, some later rooms too plain and too many rooms where you needed to kill every enemy. Overall fun experience though. If you still haven't gotten your fill of pumping enemies with missiles, try fighting Mother Brain's last phase without using hyper beam. I really enjoyed this hack. The first room is a bit more to do than I would've cared for but putting all the missles in the game in ONE Tank! Thats nice. It leaves the rest of the game for all the extra supers. This hack kept me on my toes. 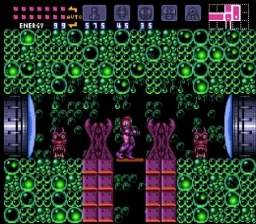 It wasn't too confusing but it made me question every possible path to take, which is exactly what Metroid should do. My only dissapointment with this hack was Lower "Easy" Norfair. by the time you get here this hack has wowed you with places, backgrounds, theme and design motif array that is awesome. Then you get to Lower "Easy" Norfair and it felt bland. its a bunch of huge rooms all with the same tilesets and having to kill all those enemies to get through those rooms is a bit much. By the time you've finished Ridley off, you are ready to just get out of Lower Norfair as quickly as possible. The Escape Sequence is brilliant. .....Murder Ship, best area name ever! I did not enjoy Oxide. From these reviews, I was expecting a fun, goofy hack to spend the evening. Instead I got repetitive rooms, too many gray doors requiring enemy clearing, strange design decisions and overall a lack of fun. I quit during the escape sequence when I found a gray door at the end of a large room where I learned I had to backtrack and kill several enemies, already low on time. It was the last straw. There is some charm and 'silliness' to be had, like the exorbitant missiles, but it's not enough to make up for the rest of the hack's shortcomings, and I wouldn't really recommend this to others. The fact that you got a ton of missiles from the start was very wierd. 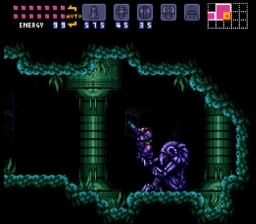 What I like about Metroid is the process of becoming stronger and stronger with the time and that killed it a bit for me. However I like that you can kinda choose where to go first. I ended up going to Draygon with few equipment and powersuit while I was really overpowered when I entered the "murder ship" (LOL) and totally destroyed Phantoon. On the other hand the level design wasn't that great. The rooms felt uninspired. And the most annoying and repetitive thing were the gray doors. You have to clear rooms ALL THE TIME to progress. There's even a big giant room you have to clear from enemies during the escape sequence (!!!) which was the reason I finally ended up closing the emulator without finishing the hack like Zexis, also because I went the wrong way, wasted a lot of time and got confused. The creator should definitely have blocked off more areas during the escape sequence. The only part which really kept me going was one surprising and thrilling part in the toxic tank. That was really awesome and fun. I won't spoil it here of course. Speaking of the toxic tank, backtracking to get items in this hack is HELL. The areas aren't connected very well which means that sometimes you have to go back for 15 minutes just to get some items you remembered from earlier just to go back 15 minutes once again. I don't know anymore how many times I had to go through the whole tank just to get somewhere. TL;DR: I don't know if I should recommend this. If you're really out of hacks to play, you can give this a try, but expect a lot of tedious room clearing, backtracking and questionable design choices. I'll give this a 3/5 though, because I still had some fun while playing this. Fun? weird? strange? oddball? entertaining? if you chose any of these words you'd be correct. Oxide is an interesting hack with plenty of surprises. Finding kraid was a nightmare, but other than that, this hack does it's best to be as wacky as it can be.